My husband and I generally are in agreement when it comes to food, except for Thanksgiving dinner! He, sticking to tradition, likes to roast a whole turkey while I prefer to cook white meat and dark meat separately, sous vide for the breast and confit for the thighs. We have been serving two kinds of turkey for the past few years now. The other issue where we deviate from each other is the appetizer. He doesn't want to ruin anybody's appetite for this once a year feast while I feel it is proper to have something guests can much on while waiting for meal to be ready. We came to a compromise that I can make a little something for the guests to nibble on. After having done nothing for two days due to an eye surgery, I got antsy. The doctor's prescription was, "Take it easy. Don't do much." I did nothing but sit, sleep and "watch" movies. But today I have an urge to make something. I just realized that I am a hyper person. I should feel the same way when it comes to cleaning. My house would be cleaner! I searched my brain to come up with what I could make today that is easy and simple with ingredients I have at home. My husband would think that I am crazy if I had asked him to buy something for me so I could cook. Oh....I can make party nuts!! I have nuts, butter, brown sugar, salt, and chipotle chili powder. Once my husband left home, I started to get to work. I measured 4 cups of mixed nuts (1 cup each of walnuts, hazelnuts, almonds, and peanuts) and put them on a baking tray together with a few sprigs of fresh rosemary. Bake at 325 for 10 minutes until the nuts are very hot and turn a few shades darker. It's important that your nuts have to be absolutely fresh. While the nuts are roasting, cut 1 stick of butter into small cubes and put in a large mixing bowl, add 1/2 cup lightly packed brown sugar, 1 teaspoon smoked salt (or regular salt), and 1/2- 1 teaspoon chipotle chili powder (or cayenne pepper). Add the hot nuts to the butter mixture immediately. The heat of the nuts should melt the butter and sugar considerably. Taste it. Does it need more salt? More chili pepper? Now put the nuts back in a 250 oven and bake about 8-10 minutes. Be careful not to burn the nuts. 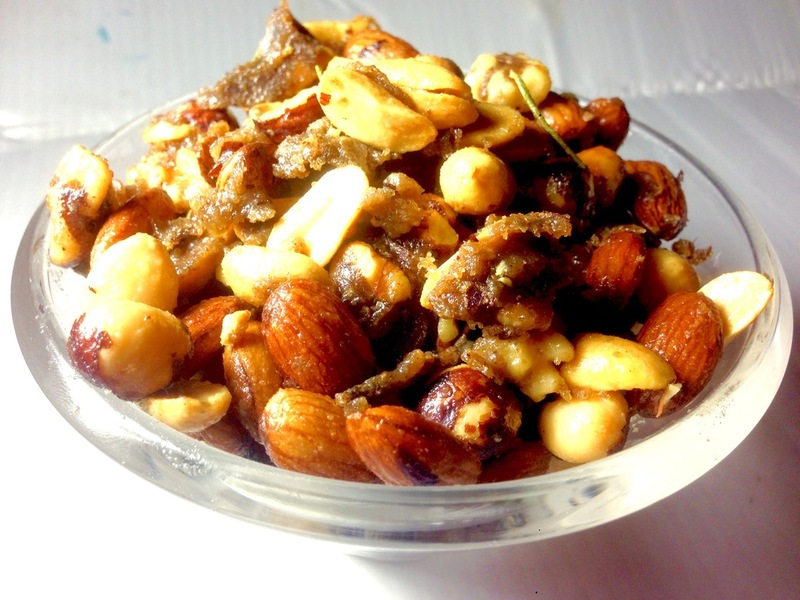 The nuts are buttery, sweet, and salty with a little hint of rosemary and heat, perfect with a glass of crisp bubbly. I particularly love the walnut in this recipe for its unusual shape that allows seasoning to cling to it. Once cool, keep the nuts in a airtight container. I will warm the nuts in a 250 oven for 5 minutes before serving, just to melt the butter. I can do this while visually impaired, so it would be much easier for you. Writing this post is a lot harder than making the nuts!